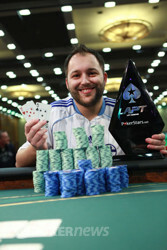 Congratulations to Daniele Nestola, Winner of the LAPT Grand Final (R$289,300)! It only took approximately four of play at today's final table and start-of-the-day chip leader Daniele Nestola has emerged victorious! Due to a deal made when play got down to heads up, Nestola earned himself R$289,300 and the coveted Latin American Poker Tour title. The final table was filled with excitement and included one of the biggest names in poker, Team PokerStars Pro Daniel Negreanu. He wound up with a six-place finish worth R$48,730 after falling to eventual third-place finisher Carlos Ibarra. After the elimination of Ibarra in third place, Nestola and Nicolas struck a deal. At the time of the deal, Nestola had 4.405 million in chips to Nicolas' 2.78 million. They both agreed to take R$250,000 each and leave the title along with R$39,300 to play for. From there, things didn't last long at all. On the final hand of the tournament, Nestola raised all in on the turn with the nut straight. Nicolas made the call for all of his chips holding top pair and was drawing stone dead. Nestola knew it and began celebrating with his group of friends. 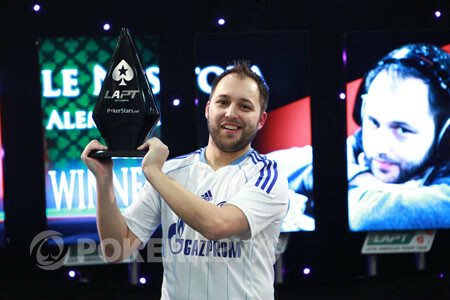 That wraps up PokerNews' coverage of the 2012 PokerStars.net LAPT Grand Final, but the fun isn't over yet. The LAPT party is being held tonight and should provide one last hurrah for all of us here in Brazil. We'd like to thank everyone for following along and congratulations to all of the winners, especially to the latest champion, Germany's Daniele Nestola. For more PokerNews tournament coverage, head over to our updates of the EPT Copenhagen Main Event. Daniele Nestola limped in from the button and Gasperino Nicolas checked his option in the big blind before the dealer ran out the flop. Nicolas led for 150,000 and Nestola made the call. The turn was the and Nicolas fired 425,000. Nestola raised all in and Nicolas snap-called. Nestola tabled the for a seven-high straight and Nicolas was drawing dead with the . The river completed the board with the and officially ended the tournament. Nicolas finished in second place and due to the deal, took home R$250,000. From the button, Gasperino Nicolas raised to 150,000. Daniele Nestola called from the big blind and the flop came down . Nestola checked and Nicolas fired 200,000. Nestola folded and Nicolas won the pot. Two hands later, Nicolas raised to 125,000 from the button and Nestola three-bet to 290,000. Nicolas called and took a flop of . Nestola fired 315,000 and Nicolas folded. The two players have made a deal with the below chip counts. Both have opted to take R$250,000 and play for the difference of R$39,300. The payouts page now reflects the new prizes. Carlos Ibarra and Gasperino Nicolas saw the flop of after unknown preflop action. Nicolas checked and Ibarra moved all in. Nicolas snapped with the . Ibarra held just about as much nothing as you could with the . The turn was the and river the . 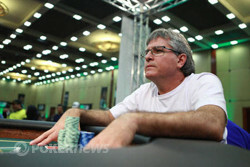 Nicolas was left with nothing but eight high and headed out the door in third place for R$148,840. From the small blind, Daniele Nestola limped in. Gasperino Nicolas raised to 175,000 from the big blind and Nestola came back with a reraise to 375,000. Nicolas called. The flop came down and both players checked to see the land on the turn. Nestola checked, Nicolas bet 300,000 and Nestola called. The river was the and both players checked again. Nestola tabled the and Nicolas mucked his hand. The three remaining players paused to talk about a deal. "We need chip counts," said Daniele Nestola looking at the tournament director. The chips were counted and the stacks below we what they had. The numbers were quickly crunched and shown to the players. 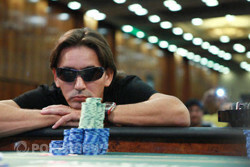 Nestola wanted the title and mentioned that if the three were going to make a deal, he wanted to be awarded the title as he was the current chip leader. The other two players didn't agree and said they would rather play on. That said, the cards are back in the air. As always, thanks to Carlos Monti for the photos. From the small blind, Gasperino Nicolas limped in. Carlos Ibarra checked out of the big blind and the flop came down . Nicolas bet 75,000 and Ibarra raised all in for 915,000. Nicolas thought it over and then folded, showing the . Ibarra showed just the .